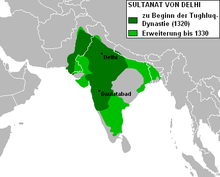 Sultanatus Delhiensis vel Delliensis fuit imperium Islamicum magni momenti in India septentrionali, quod 1206 - 1526 exstabat. Caput fuit Dellium. Fernand Braudel: The Perspective of the World, Editio tertia Civilization and Capitalism. Novi Eboraci: Harper & Row, 1984. Sir Henry Miers Elliot et John Dowson (eds. ): The History of India as told by its own Historians, Nova editio, Novi Dellii, 1990. Peter Jackson: The Delhi Sultanate: a political and military history. Cantabrigiae, 1999. Hermann Kulke: Indische Geschichte bis 1750 (Oldenbourg Grundriss der Geschichte). Monaci: Oldenbourg, 2005, ISBN 3-486-55741-6. --do.-- Editio septima, The Mughal Empire, Mumbai, 1973. Khaliq Ahmad Nizami: Some Aspects of Religion and Politics in India in the Thirteenth Century, Novi Dellii, 1961 (ed. revisa: Novi Dellii, 2002). Dietmar Rothermund: Geschichte Indiens vom Mittelalter bis zur Gegenwart. Monaci: C. H. Beck, 2002, ISBN 3-406-47994-4. ↑ Ad adiectivi formam vide disputationem. Novissima mutatio die 1 Novembris 2016 hora 16:16 facta.